Deeg Palace traces the journey of an architect through the fantasy water palace of Deeg, Rajasthan which was the capital of 18th century Jat kingdom extending up to Delhi and Agra. Built by the jars to recreate the symbol of Radha and Krishna's romance (raas leela), it portrays a unique cultural confluence of Mughal- Rajput garden palace architecture. Enriched with explanatory photographs and three-dimensional drawings of its captivating water cascades, scintillating water features and exquisitely decorated stone architectural embellishments, the book is a tribute to its unknown artisans. It captures the spirit of Deeg by not only analysing the marvellous stonework and architecture but also the modulations and metamorphosis of events which led to the shaping of Deeg. It sees Deeg as a part of a larger fabric beyond just its magnificent superstructure and decorations, the buildings mirroring the times they were constructed in. Intended, equally, for both the creatively informed class of people and the general reader, the book is visualised with an aesthetic and spectacular eye dedicated to Deeg's eternal heritage, an asset for any art connoisseur. 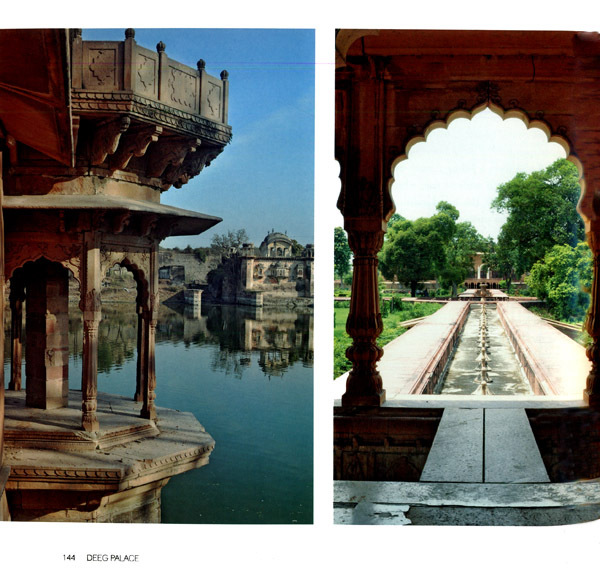 Bharat Chugh, is a practising architect and amateur photographer based out of Delhi. An alumni of the School of Planning and Architecture, New Delhi, he has participated in various prestigious projects on design and build model around the world. His specialisation has been promoting handcrafted Indian marble and stone work of several trained master artisans, who have been working in stone for generations. Some of them even trace their lineage to the Mughal era. Our first trip to Deeg was made way back in 1996, while sourcing stone and studying designs for stone architectural embellishments. The purpose behind the research was to refurbish the grand palatial mansion at Kensington Palace gardens, London for Favermead Ltd, restored by Professor Nasser David Khalili. Eventually, this mansion was bought by Shri Lakshmi Mitral. The enchanting designs left a permanent impression on our minds. Subsequent work and projects distracted us to marble and pietra dura for years. In 2010, our prestigious friends Mr and Mrs Sandhu commissioned us to do up their Haveli in Nuh, Haryana. The stone shortlisted was from Bansi Paharpur and the chosen style was the Mughal- Rajput. Yes, Deeg, the masterpiece encapsulating a rich legacy had to be revisited. Perhaps, this time, we went with a more experienced eye. The view and the walks were all the more magnificent. The camera we were carrying was a Nikon DSLR and we took around 1,000 photographs. Our clients appreciated the colour, texture and workmanship of the stone from Bansi Paharpur. The stone was eventually procured from Bayana and its surrounding areas and the project turned out to be yet another amazing experience. The idea for a book was always in our minds. Meanwhile Facebook helped us to get connected to a school friend, Divay Gupta, Principal Director, Architectural Heritage, INTACH who instilled the final vigour and the idea took conclusive shape at a coffee table in a Defence Colony restaurant. A small summary of the concept along with the printouts of some photographs was prepared. This was sent to the publishing house, Niyogi Books, for review. Mr and Mrs Niyogi appreciated the idea and encouraged us to work on it with full sincerity. We thank them as our first patrons. Several trips to the Deeg Palace, National Museum, National Archives and Archaeological Survey of India (ASI), Delhi and Jaipur circles have inked this endeavour. It may not be possible to name all, but inspirations were derived from writings of Kunwar Natwar Singh, Elizabeth B. Moynihan, M.C Joshi, Ebba Koch, CM. Villiers-Stuart and many unnamed scholars and authors to whom we are highly indebted. Udita Gupta, a budding architect helped us with the measured drawings and 3D visuals. From a point of view that acknowledges the importance of tradition, precedent, style and ideology in architectural construction, in this book we discuss critical details from a contextual and technical standpoint; considering how they perform, how they add to or distract from the building as a whole and how some have been adopted in Deeg. 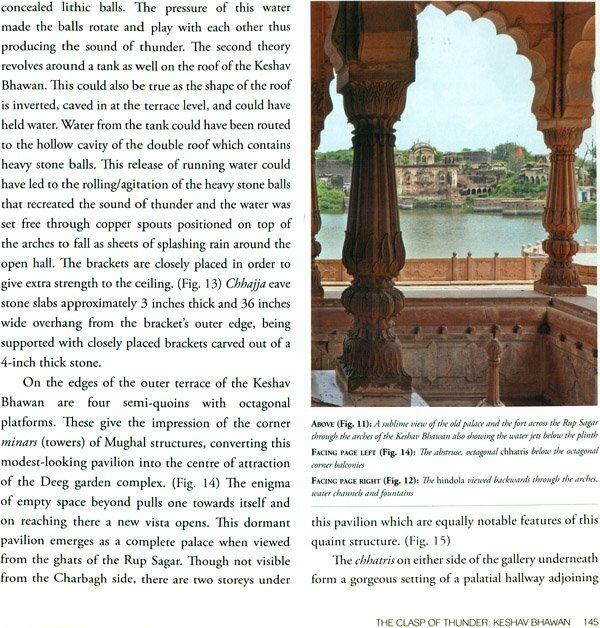 This book Deeg Palace is a journey through the wondrous and alluring palaces of Deeg (also called Dig), created by the Jats on the enticing plains of Braj in the early 18th century, when they were on the verge of conquering Delhi at the behest of the falling Mughal Empire. Not much has been said of this fantasy palace, which was recreated to symbolise Radha and Krishna's Raas Leela, though it was much admired by the British. The palace complex together with its water gardens was a summer retreat for the maharajas of Bharatpur. The layout comprises of several palaces called bhawans, interwoven with series of char baghs (four gardens) and water gardens. The speciality of the gardens is their remarkable water system that works even till date. Over 900 fountains were built to be fed by an overhead water tank through earthen pipes and many of them go through ostentatious water displays twice a year. Deeg was chiselled in the times when the whole of north India was going through transitional episodes of several political, socio-economic, religious and demographic developments. It is not a solitary entity, rather a complex interplay of theological, social, cultural, economic, political and technical factors. The book captures this spirit of Deeg by not only analysing the marvellous stonework and architecture, but also the modulations and metamorphosis of events which led to the shaping of Deeg. It sees Deeg as part of a larger fabric beyond just its magnificent superstructure and decorations as buildings are a mirror to the times they were constructed in. Discussed in straightforward language, the book starts with the origin of the palace and outlines the continuous development through its various manifestations during the rule of the Jats. Subsequently, the layout and planning principles are highlighted. Enhancing its utility are the clearly drawn plans in 2D and 3D. The photographs celebrate the richness of classical architecture with elevations of its symmetry and details. Not inclined to theorise, we have tried to express our concepts mainly by way of photographs. The double-caved chhajja with brackets, axial water channels and extensive use of Mughal baluster columns on Shahjahani cusp-engrailed arches mark the architectural style of the palace complex. Every fort and palace has its own destiny in which glory and despair alternate, so too it is with Deeg which has been veiled in obscurity for many years. 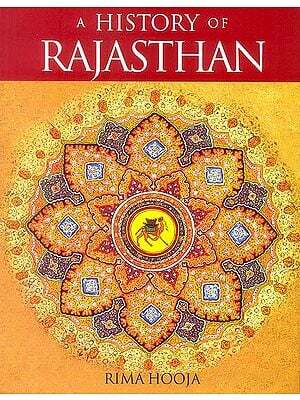 Through this book we have tried to bring to life imprints of time by looking at it with new perceptions, unravelling the mysteries of history to establish a sense of permanence, where the stones of palaces and bhawans speak to the living. Instead of its strategic importance as a military stronghold in the past, it now has significance in terms of tourism and as a centre for art. This magical and spatial palace epitomises the Jat and Rajput composite culture, for here, science and art, principles of aesthetic and engineering, form and function, history and legend, blend together to give an unparalleled experience. The book demonstrates the enormous range of themes and motives for those who wish to look at buildings old and new with an informed eye. Intended for the widespread class of educated people, it is planned as a book which is visualised with an aesthetic and spectacular eye dedicated to Deeg's eternal heritage. It provides a deeper insight into her glorious past, tracing through a passage of over 300 years, the journey of a great creative genius. Devised to serve a dual objective, the book on one hand is an academic endeavour elucidating epic building traditions, their various styles along with their historical, social, political, religious and cultural background so as to arrive at the intrinsic meaning and artistic merit of these monuments. On the other hand, the complex technical nuances of the architecture are easily explained by the book's strong pictorial and visual character. Its aesthetic and breathtaking aspects thus help a reader/visitor to seek his own interpretation of the magnificent monuments. The primary information provided is generally useful, serving as a manual for common art lovers, who would find a rich treasure of material in it. This book is not only meant for conservation and architecture professionals, rather a vivid and intellectual treat awaits every kind of reader. Like all the Rajput palaces and mansions, the first area of interest in terms of its structure is the grand entrance of Deeg Palace: the Singh Pol or the Lion Gate. Here the journey begins into the historic past of the city palaces, their architectural grandeur and historical achievements, which is also the starting point in understanding, expressing and communicating the continuity of a vibrant cultural heritage rooted in [he entire palace complex. Within this gateway, the quadrangles are piled with huge open paved areas, spacious courtyards, handsome sandstone bhawans and a paradise water garden. Each one of these bhawans or palaces is discussed as individual chapters, the first one being Gopal Bhawan or the grand reception palace. Marked by a common rhythmical coherence, this palace is the hallmark of a comprehensive technical, historical and aesthetic analysis. The planning of this symmetrical palace mirrors the perpetuity in the cultural evolution of Deeg Palace. The other palaces discussed individually are Kishan Bhawan or Diwan-i-Khas, Nand Bhawan or wrestling palace, Keshav Bhawan, Suraj Bhawan and Hardev Bhawan. An entire chapter is devoted to the concept of the symmetrically arranged twin pavilions of Sawan and Bhadon. The buildings are often more fascinating than beautiful. The jewel in the crown of Deeg, the hindola, a lone example of a free- standing white marble arch, is another enigma where we try to demystify the entire Indian monumental architecture by excavating away the layers of the past to discover underlying facets of the universal truth. The penultimate chapter deals with the water gardens, its features and ongoing restoration work. This book presents Deeg in the context of its past and present and poses an important question about its future-the issue of conservation. The present- day usage of the complex, mainly due to population growth, has brought it on the verge of collapse. While the structure still exists even after so many centuries, its continued survival cannot be assumed without an active commitment to its maintenance.